Microsoft’s Bing is one of the mostly used search engine. So it is very much vital and essential that your website is added to Bing. Although it is a easy task just like as Google, but most of the Webmaster forgets to Add and Verify their website or blog to Bing search engine. 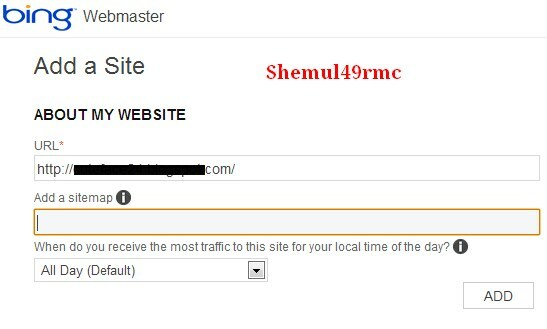 Today I am going to show you the easy way to Add & Verify Website to Bing and Submit Sitemap to Bing for better traffic. You just need to follow these basic steps. With Bing™ now powering Yahoo! and Facebook search, nearly 30 percent of all Web traffic is delivered through Bing™. Because of this, it is more important than ever for website owners to ensure their Websites are indexed in Bing™. Bing™ Webmaster Tools allow you to submit and verify your Website for indexing. Once it is verified, you can also use Bing™ Webmaster Tools to improve your Website’s SEO and view important data on its performance. Improve your Website’s search engine optimization get more traffic. See and control how Bing™ crawls and indexes your Website. See backlinks, inbound links, and keyword performance for your Website. Provide an XML sitemap for your Website. Detect crawl issues and view details on redirects, malware, and exclusions. Step 1: You need to sign up for Bing Webmaster Tool, otherwise you can just Add your site to Bing. For this Go through 3rd Step and skip step 1 and 2. Though I recommend to Sign-up. Go to Bing Webmaster Tool. Step 2: Write down the URL of your website. And Click on Add Site. Step 3: If you just want to add website and don’t want to Sign up for Bing Webmaster then Go to Add a Site To Bing and follow the below steps. Now Add the Sitemap link of your website and Click on Add. 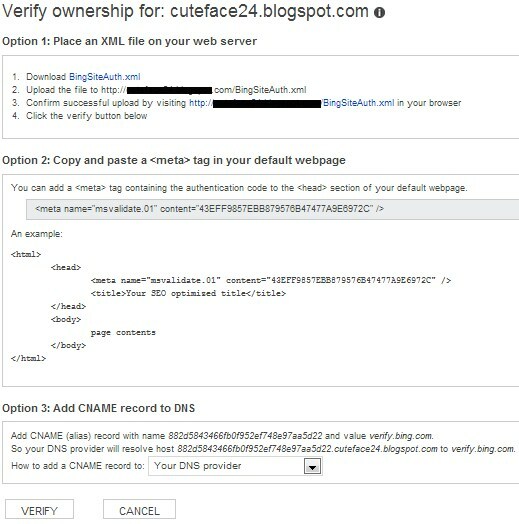 Step 4: Now you need to verify Ownership for your site. You can See there are 3 Options to do that. You can choose whatever you prefer. These two methods are easy. Upload the file to root server. Confirm successful upload by visiting http://yoursite/BingSiteAuth.xml in your browser. Add the <meta> tag containing the authentication code to the <head> section of your default webpage. Find </head> and Paste the Code just above it. Now Click on Verify Button. You are Done ! I’ve been using SEO quake and google analyrics, those are great tools. But there is this one tool that I really love to use and that is Colibri tool and ahref. It can help me keep track on traffic and find the right keyword.